CF-IGM at Ottawa / Uplands - CYOW, Ontario. CF-IGM at Lac Dufault, Québec. • CF-IGM Rio Canadian Exploration Ltd., Ottawa, ON. (a subsidiary of the Rio Tinto Mining Company), Delivered 13-Dec-1955. • CF-IGM Canadian Aero Mineral Surveys, Ottawa, ON. Circa 1961. Operated by Survair Ltd. Accident: near Hornepayne, Ontario. 03-Feb-1966. The aircraft on wheel-skis, was taking off from a snow strip with the pilot and three passengers on board. After becoming airborne, the aircraft settled and contacted the lake ice at the end of the airstrip, bounced and returned to the surface, incurring considerable damage. The strip was 1,600 feet long and the pilot reported that most of the strip was used, but the aircraft failed to accelerate adequately due to the snow conditions. The damage was repaired. Note. The aircraft had always operated as a survey ship from delivery until late 1969. • CF-IGM Spartan Air Services Ltd., Ottawa, ON. Circa 1970. • CF-IGM Northwestern Airways Ltd., Noranda, QC. Circa 1971. • C-FIGM Air Brazeau Inc., Rouyn, QC. Circa 1974. 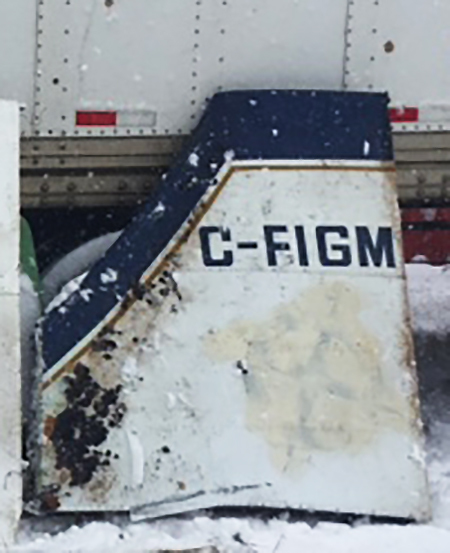 • C-FIGM North Canada Air Ltd., (Norcanair), Prince Albert, SK. Sep-1976. Accident: Uranium City, SK 16-Nov-1979. The pilot reported that on take-off, carrying nine passengers, the aircraft was sluggish and when the tail came up a swing to the left commenced. Full right rudder and aileron failed to correct the swing and the aircraft became airborne, still turning left so the take-off was aborted. After touchdown, the Otter continued left off the runway for a distance of 150 feet into rough ground and the right main gear collapsed. Eventually declared as un-economic for repair and parted out. • C-FIGM. Cancelled from register 27-May-1982. Otter number 75 was delivered on 13 December 1955 to Rio Canada Exploration Ltd., (a subsidiary of the Rio Tinto Mining Company) as CF-IGM. It was in a mustard colour with black cheatline and trim, and red rudder and wingtips. It was the first of several Otters to be used in the specialised role of geophysical survey. The Otter was converted for survey use, the cabin containing one thousand pounds of delicate instruments, in effect converting the aircraft into a flying laboratory. The equipment consisted of an automatic magnetometer console, a channel recorder, an aero-path camera and a low-pulse frequency transmitter and receiver in the wingtip pods. The wingtip extensions and pods were engineered by DHC. The equipment was intended to detect conductors in the ground, which might prove to be sulphides, possibly containing lead, zinc or copper or other minerals. From 1955 to 1961, systematic coverage of potential mineral areas throughout northern Canada was undertaken by Gresham Exploration Ltd., (a wholly-owned subsidiary of Rio Canada) with CF-IGM, which was named “The Rio Explorer”. 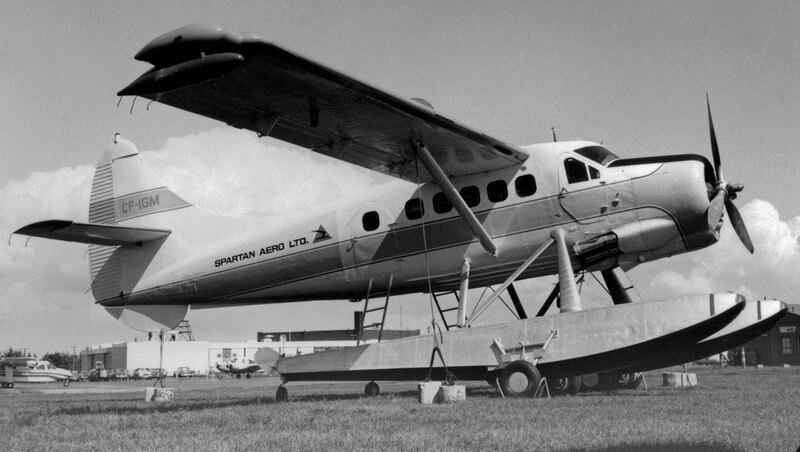 The Otter was based in Ottawa and operated and maintained by Laurentian Air Services on behalf of Gresham Exploration. The Otter was registered to Gresham Exploration Ltd., on 24 July 1956. During this period 1955 to 1961 nearly 200,000 line kilometres of survey were accomplished with no accidents of any kind, and two valuable mines were discovered. The Otter established itself as the ideal vehicle for this task, able to act as a utility transport as well as performing its primary geophysical duties. For example, from May 1956 IGM was flying from Rouyn, Québec moving in September to New Brunswick, working on floats from Evansdale, then on wheels that winter from Chatham. The Otter enabled the company to cover more mileage in a week than could be covered in a year by the old survey methods and was a far cry from the immortal sourdough of the early part of the century. Averaging 900 hours per year (one third of which was spent combing the remote trackless forest areas, in its role of flying prospector), the “Rio Explorer” usually operated in float plane configuration from May to September, converting to wheel-skis for the winter months. For these survey flights, the crew consisted of the pilot, navigator and project supervisor (a geophysicist), searching for such minerals as copper, iron, uranium, asbestos, gold, beryllium and perlite. Using a photo-mosaic strip map for navigating the survey route, the crew track-crawled a designated area at a ground clearance of 60 metres, skimming the tree tops and lakes as the equipment transmitted, received and recorded variations in the electrical and magnetic characteristics of the ground, which indicated lodes of mineral wealth. In order to ensure that each area was thoroughly covered, the crews flew parallel line courses one eight of a mile apart. Navigation was visual using photo mosaic laydowns. Flights were scheduled in the early morning and late afternoon, when air turbulence was at a minimum. As a result, to maintain a flying average of three hours a day, it was sometimes necessary to work a ten hour stretch. The survey routes were photographed with a remote-controlled camera installed in the cargo drop hatch in the rear compartment. A wide-angle lens of 135 degrees covered the parallel flight lines and an F2 lens together with the use of ultra-fast film permitted the taking of clear photographs well into the evening. When a find was made it became necessary to send teams to the area for ground geophysical and geological study. Here again the Otter could assist, flying in personnel into the nearest lake, completing in a matter of hours what would have taken days by over-land routes. In 1961 CF-IGM was transferred to Canadian Aero Mineral Surveys of Ottawa and for the next eight years was operated on its behalf by Survair Ltd., an associated company set up solely to operate geophysical survey aircraft. The Otter was registered to Survair Ltd., on 12 April 1961. Its task during this period was to perform contract surveys throughout Canada for a wide variety of mining companies. Examples of such surveys flown by IGM were in July 1964, an electro-magnetic survey of the Larder Lake Mining Division, Ontario, flying from Larder Lake for Upper Canada Mines and May 1965, a geophysical survey of Geary-Mahaffy Townships, District of Cochrane, Ontario. In the course of a survey the Otter was damaged in an accident on take-off near Hornepayne, Ontario on 3 February 1966. IGM, on wheel-skis, was taking off from a snow strip near Hornepayne with the pilot and three passengers on board. After becoming airborne, the aircraft settled and contacted the lake ice at the end of the airstrip, bounced and returned to the surface, incurring considerable damage. The strip was 1,600 feet long and the pilot reported that most of the strip was used, but that the Otter failed to accelerate adequately due to the snow conditions. The damage was repaired without delay and IGM returned to service. In April 1966 it was conducting a survey in the Chapman Lake area of Ontario, flying from Nakina. In October 1966 and again in February 1967 it was surveying the Cardiff Township in Ontario. In August 1967 it was on a survey of the Blind River area, Ontario for Denison Mines, based at Elliot Lake. On 31 March 1968 the registered owner was changed to Canadian Aero Services Ltd., Ottawa but it continued to be operated by Survair. In April ’68 it was flying out of Sudbury, again surveying the Blind River area and in October 1969 it was based at Red Lake, Ontario surveying the Shabumeni and Swain Lakes areas. It continued in operation by Survair until August 1970. On 24 August 1970 the Otter went on lease and was registered that day to Spartan Air Services Ltd., of Ottawa, on lease from Canadian Aero Services Ltd. Spartan were a large survey company, with many aircraft, but this was the only Otter they ever operated. For this operation it was put on the AOC of Kersey Airspray. 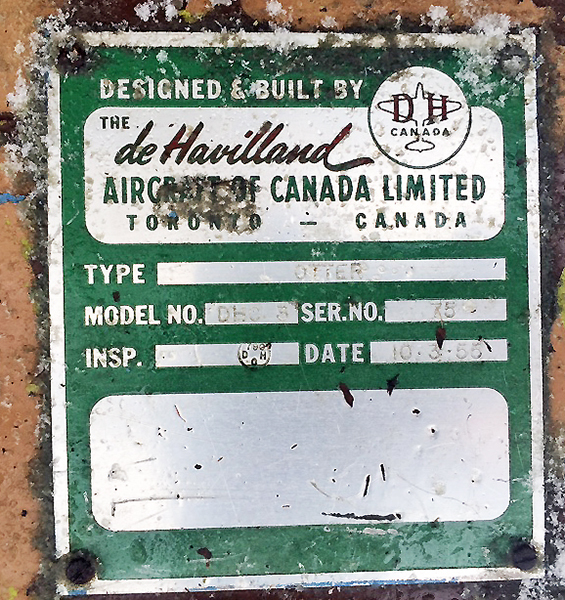 It was noted at Uplands Airport, Ottawa in August 1970 with Spartan Aero titles and logo on the fuselage side. In April 1971 it was engaged in a geophysical survey over the Max Lake area of Ontario for Dome Exploration, flying from Thunder Bay. In August 1971 it carried out a geophysical survey of the South Porcupine area, Ontario for the Texas Gulf Sulphur Company. Bob Bolivar flew with the Otter and recalls some of his exploits: “One operation we were based at Island Lake, Northern Manitoba in early February and it was extremely cold. We were staying in a summer fishing camp close to the Indian Reserve and across a lake from the airstrip. We had a skidoo for transportation to the airfield. The routine upon landing after a survey flight was to remove the transmitter unit and take it by skidoo to the camp and then return for the oil, which the engineer had drained, then ferry this to the camp, put engine covers and wing covers on the aircraft, transport the crew to the camp and then repeat in reverse order the next day. It would usually involve four hours prep time before a flight and possibly two or three hours after the flight, so long days. If operating off a lake, logs were placed and the aircraft taxied onto the logs so the skis wouldn’t stick to the snow”. “There was one incident that happened in Northern Saskatchewan while operating on floats. John Stoa was pilot and I was navigator. We had taken off from Pelican Narrows to go to Lac La Ronge and decided to fly over Lower Foster Lakes area en route. As we approached the area we let down to survey height, had started the line and lost the engine. Luckily there was a narrow lake to our left and then pilot was able to manoeuvre the Otter to a safe landing on the lake. We looked at each other and asked what we would do now. There was partial power in the engine so we taxied down the lake looking for a good place to beach the aircraft. As we rounded a corner there was a fishing lodge and a perfect beach. We contacted The Pas to inform what happened and our location so they could contact our office in Ottawa. An engine was flown in by a Beechcraft C-45 on floats and the engine change completed there”. Otter IGM continued flying for Spartan Air Services until October 1971, when it was returned off lease to Canadian Aero Services Ltd. Its survey equipment was removed, its days as a survey aircraft over. 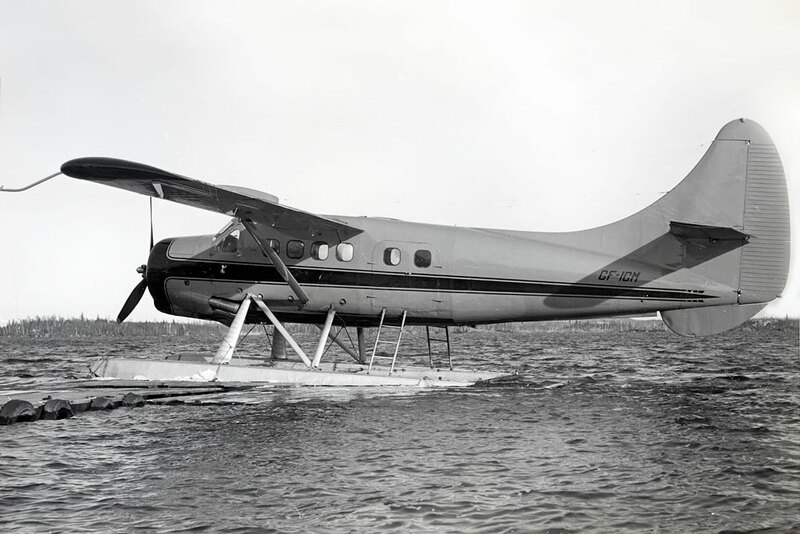 It was put up for sale as a normal transport Otter and sold to Northwestern Airways Inc of Noranda-Rouyn, Québec to whom it was registered on 26 October 1971. It was painted into their colour scheme and entered service as part of their fleet. It was noted October 1973 flying out of Lac Dufault, Québec. The company changed its name to Air Brazeau Inc., to whom the Otter registered on 2 January 1974 and continued to serve the bush country of Québec from its base at Rouyn. IGM was the only Otter flown by Air Brazeau, which also had in its fleet several DC-3s, Beavers, Apaches and Cessnas. After three years of flying in Québec the Otter was sold and moved to Saskatchewan. Its new owner was North Canada Air Ltd., (Norcanair) to whom it was registered as C-FIGM on 16 September 1976. The Norcanair main base was at Prince Albert, Sask although the company’s Otters served the bush country of Northern Saskatchewan. IGM was noted at Calgary with Field Aviation in November 1976 being prepared for service with Norcanair and painted into their colour scheme. It joined Norcanair’s other two Otters C-FJFJ (147) and C-FYLZ (247) and flew out of La Ronge and Uranium City, serving the bush country of Northern Saskatchewan. As well as charter work, Norcanair flew a scheduled service out of Uranium City with its Otters, known as the “Lake Sked”. The company had a base at Martin Lake, with a hangar. The schedule was between Uranium City, Fond du Lac and Stony Rapids. As one report put it: “Stony was on the route of the Lake Sked, a thundering Single Otter on floats that leap-frogged along Lake Athabasca’s north shore”. It carried native people, drums of fuel, food supplies and equipment. Norcanair F-27s flew into Uranium City and Stony Rapids from La Ronge, Prince Albert and Saskatoon, connecting into the Otter services. Norcanair’s three Otters alternated between being based at La Ronge flying charters and the base at Uranium City, flying charters and the schedule. IGM continued in service with Norcanair for three years, until it met an accident on 16 November 1979 at Uranium City. The pilot Emil Mesich reported that on take off carrying nine passengers the aircraft was sluggish and when the tail came up a swing to the left commenced. Full right rudder and aileron failed to correct the swing and the Otter became airborne still turning left, so the take-off was aborted. After touchdown the Otter continued left off the runway for a distance of 150 feet into rough ground and the right main gear collapsed. (As an aside, sadly pilot Mesich was killed some time later in the crash of Otter CF-DJA (459) in northern BC., in September 1982). IGM had flown 15,826 hours at the time of the accident. Although appearing to be relatively minor compared with some Otter crashes, IGM had been badly damaged on the rough ground. Norcanair arranged with Southern Aviation Ltd., of Regina, Sask to repair the Otter. That winter the Otter was trucked all the way south from the crash site at Uranium City to Southern Aviation’s facility at Regina but on detailed examination it was not an economic prospect to repair. Southern Aviation purchased the wreck from Norcanair in March 1980 and for years it languished at their facility, lying alongside Otter CF-DIZ (460), another Otter which had crashed in northern Saskatchewan in October 1979, and which Southern Aviation had also retrieved from the bush. C-FIGM was cancelled from the Register on 25 May 1982 and arrangements were made to “part out” the wreck of IGM and sell it off as spare parts. In November 1991 the tail section of IGM was exported to Sweden, where it was used in the repair of Otter SE-KPB (274), which had suffered some damage. In 1995 Southern Aviation Ltd., sold the wreck of Otter CF-DIZ (460) to T.C.Aviation of Saskatoon, Sask who rebuilt it as a turbine. At the same time, T.C.Aviation acquired what was left of Otter IGM and moved it to their facility at Saskatoon. For the next number of years it languished on a farm outside Saskatoon, owned by the owner of T.C.Aviation. In October 2016, T.C.Aviation sold the remains of Otter IGM to Stolairus Aviation Inc and they were trucked to the company’s base at Kelowna, BC where Stolairus began preparations to rebuild Otter C-FIGM, a process estimated to take two years.